JEFFERSON CITY, MO - According to the Centers for Disease Control (CDC), the flu costs the United States more than $87 billion annually and is responsible for the loss of close to 17 million workdays each flu season. Tens of thousands of people are hospitalized and thousands die from flu-related illnesses each year. Last year's flu season was the worst since 2009 with health officials estimating more than 700,000 people were hospitalized with flu or flu-like illness. Missouri reported 133,957 laboratory confirmed cases of flu and more than 2,000 pneumonia and influenza associated deaths. 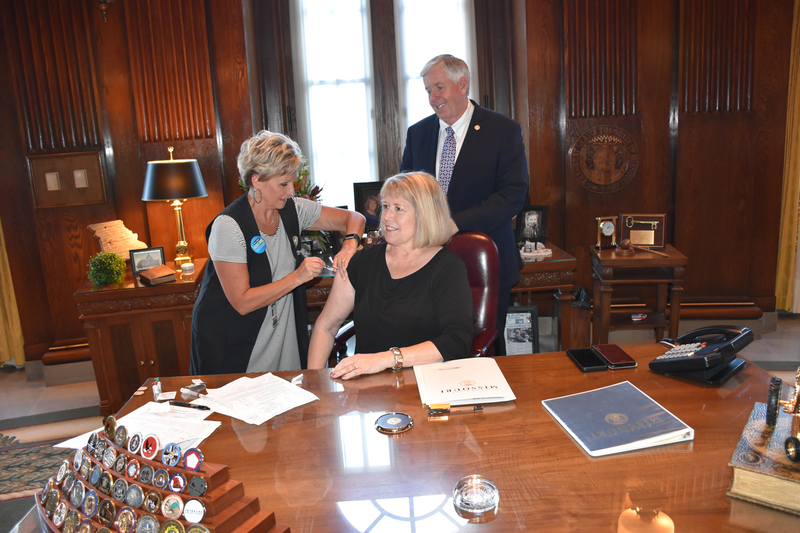 "Employers can take an active role in reducing the impact of flu by encouraging their employees to get a flu shot," stated Governor Parson. Employers play a key role in protecting employees' health and safety while increasing productivity, reducing absenteeism, lowering healthcare costs and limiting other negative impacts of the flu. There are many steps employers can take to encourage flu vaccination including being flexible in your human resource policies to allow employees an hour or two to get their flu shot, partnering with a local provider to host a flu clinic at your worksite, or simply making sure your employees and their families know where they can get a seasonal flu shot in their community. 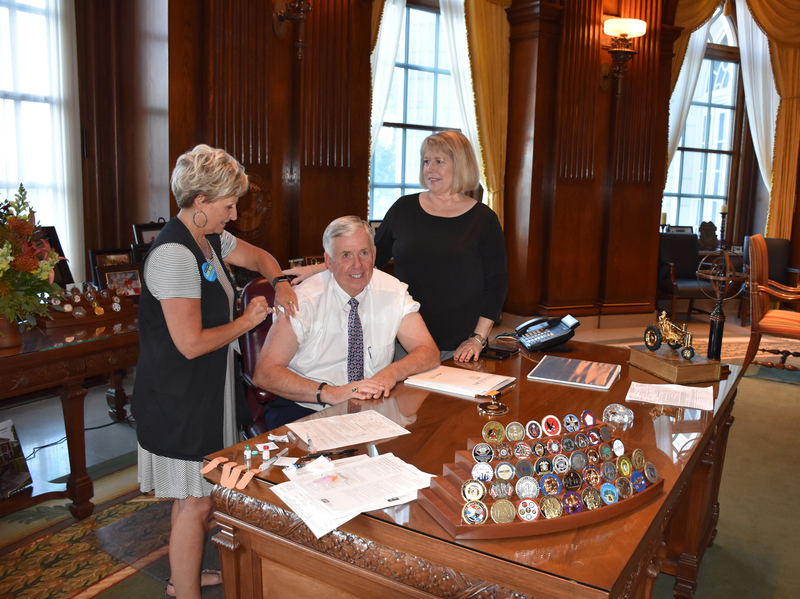 "We are focused on strengthening Missouri's workforce to make our state more competitive and keeping Missourians healthy is crucial to that success," continued Governor Parson. "The First Lady and I made sure to get our annual flu shot to not only protect us from getting the flu but also to protect those around us-those we work with, our families and especially our grandkids." "On behalf of all of the health care providers in Missouri, we want to thank the Governor and First Lady for their leadership in stressing the importance of flu shots to prevent illness," said Dr. Randall Williams, DHSS Director. The flu shot is recommended for everyone six months of age and older and is the best prevention against the flu. Flu shots are especially important for young children and adults aged 65 and older. It can take up to two weeks after receiving your flu shot for flu antibodies to develop and become effective, so vaccination is encouraged before the end of October. Go to http://health.mo.gov/flu to find a flu clinic near you. NOTE: Click here for downloadable images of Gov. Parson and First Lady Teresa Parson receiving their flu shot.